Asylo provides strong encapsulation around data and logic for developing and using an enclave. In the Asylo C++ API, an enclave application has trusted and untrusted components. The API has a central manager object for all hosted enclave applications. The following are the main classes for developing and using an enclave. TrustedApplication is the trusted component of an enclave application that is responsible for sensitive computations. EnclaveClient is the untrusted component of an enclave application that is responsible for communicating messages with the trusted component. EnclaveManager is a singleton object in the untrusted system that is responsible for managing enclave lifetimes and shared resources between enclaves. We refer to the process of switching from an untrusted execution environment to a trusted environment as entering an enclave. Every enclave provides a limited number of entry points where trusted execution may begin or resume. The trusted environment consists of one or more enclaves, which protect code and data in a sensitive workload. To create an enclave, define a class which inherits from TrustedApplication and implement the logic to host in the enclave. The TrustedApplication class declares methods corresponding to each entry point defined by the Asylo API. Initialize initializes the enclave with configuration values that are bound to the enclave’s identity. This should be used for security-sensitive configuration settings. Run takes input messages from the untrusted environment code, performs trusted execution, and returns an output message to the untrusted environment. Finalize takes finalization values from the untrusted environment and is called before the enclave is destroyed. If any of these methods are not overridden, they simply return an OkStatus. The untrusted API provides methods analogous to the enclave entry points that are defined by a TrustedApplication. These methods implement the necessary machinery to safely cross the enclave boundary. The inputs to these methods are extensible by the developer. The EnclaveClient class is responsible for communicating messages with the trusted component. EnterAndInitialize passes enclave configuration settings and optional user-defined configuration extensions to the enclave. The configuration information is essential to the identity of the enclave. EnterAndRun passes an input message to the enclave, and receives an output message from the enclave. This method may be called an arbitrary number of times with different inputs after the enclave has been initialized. EnterAndFinalize passes enclave finalization data to the enclave. Both EnterAndInitialize and EnterAndFinalize are private methods that are called by the friend class EnclaveManager. The EnclaveManager class is responsible for creating and managing enclave instances. This class is a friend class to EnclaveClient. LoadEnclave initializes the enclave with a call to EnterAndInitialize. DestroyEnclave destroys the enclave with a call to EnterAndFinalize. Entering an enclave is analogous to making a system call. An enclave entry point implements a gateway to sensitive code with access to the enclave’s resources. Arguments are copied into the enclave on entry and results are copied out on exit. The following is a snippet from our Getting Started guide to writing your first Asylo application. LOG_IF(QFATAL, !manager_result.ok()) << "EnclaveManager unavailable: "
The three enclave entry points are shown in the above code. Let’s go through each part of the main() procedure. Configure a SimLoader object to fetch the enclave image from disk. Invoke the loader and bind the enclave to a name "demo_enclave" via EnclaveManager::LoadEnclave. The Asylo framework will implicitly use the client to initialize the platform and call the trusted application’s Initialize method. Get a handle to the enclave via EnclaveManager::GetClient. Provide arbitrary input data in an EnclaveInput. In this example, the enclave input is extended with a message that contains a string read from stdin. Invoke the enclave by calling EnclaveClient::EnterAndRun. This method is the primary entry point used to dispatch messages to the enclave. It can be called an arbitrary number of times. Receive the result from the enclave in an EnclaveOutput. Developers can extend the EnclaveOutput type to provide arbitrary output values from the enclave. Provide arbitrary finalization data to the enclave and destroy the enclave via EnclaveManager::DestroyEnclave. The Asylo framework will implicitly use the client to call the trusted application’s Finalize method. We just saw how to initialize, run, and finalize an enclave using the Asylo SDK. These calls happen on the untrusted side of the enclave boundary. Now, let’s take a look at the code on the trusted side. 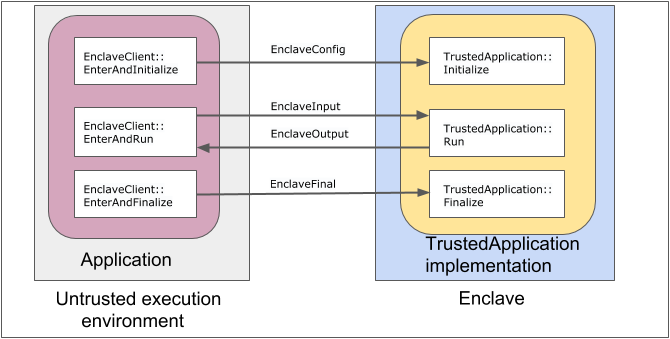 Building an enclave consists of deriving from the TrustedApplication class and overriding a number of virtual methods. Each method defines the logic to be invoked for an enclave life cycle event. The class EnclaveDemo overrides its parent’s TrustedApplication::Run method with its secure execution logic to encrypt a user message. This enclave does not have any custom initialization or finalization logic, so neither of those methods are overridden. The TrustedApplication class implements a model enclave which users may customize with their application logic. Method input and output parameters are protobufs defined by the Asylo SDK and are extensible with additional user-defined content. The enclave may provide a handler that runs synchronously at the time the enclave is loaded by EnclaveManager. The Asylo framework guarantees this entry point is invoked exactly once, and that no other thread may enter until this method completes successfully. If initialization fails and returns a non-OK status, no further entry into the enclave is possible. Many threads may invoke this entry point in parallel, so its implementation of Run must be thread safe. The application author is responsible for ensuring that concurrent access to data is managed appropriately. The last category of enclave entry is finalization. Untrusted code destroys the enclave by calling EnclaveManager::DestroyEnclave. The host application exits and the EnclaveManager itself is finalized. The Asylo runtime guarantees that no further entry into the enclave is possible after finalization. Note that in the case the enclave exits abnormally, or in the event the untrusted runtime is compromised, it is not possible to guarantee that Finalize is invoked. Applications should not rely on Finalize for correctness or for security.